MMI is proud to announce that we have received Michigan Council for Arts and Cultural Affairs (MCACA) funding to bring Mike Skory and Frog, two of Lansing’s finest blues musicians for an interactive afternoon performance following the 2017 Walk N’ Roll to be held May 6th at Island Park. The mission of MCACA is to encourage, initiate and facilitate an enriched artistic, cultural and creative environment in Michigan. One of the ways they accomplish that goal is through providing mini grants which support the arts. This is the fifth time that MMI has received MCACA funding that will provide an opportunity for individuals with significant disabilities to participate in a multi-culturally diverse activity. This performance is open to the public free of charge. The partnership of Mid-Michigan Industries Inc. (MMI), Mt Pleasant Jaycees, and the Isabella County Soup Kitchen (ICSK) worked to create a community garden in Isabella County. 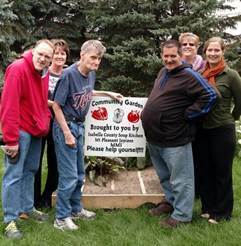 Mt Pleasant Jaycees generously provided the funds to purchase needed garden supplies and equipment. Volunteers through MMI’s Community Connection program completed the assembly of the raised garden beds and filled them with dirt in preparation of planting. The garden was then planted using the square foot gardening method to maximize production and boy did it produce! The garden provided tomatoes, peppers, cucumbers, beans, beets, several herbs, and a variety of other vegetables that were free for the picking. MMI volunteers worked side by side with soup kitchen patrons to weed and water the garden to keep it looking good and producing vegetables. MMI first became involved in the project after meeting with the Director for the ICSK, Kim Frederick to discuss ways that the two agencies could partner to benefit the community. Initially MMI volunteers took on the role of collecting soup kitchen donation canisters. These donation canisters, located at several businesses in the Mt Pleasant area, provide a valuable source of support for the soup kitchen. During this discussion Kim shared her desire for a garden that would provide fresh produce for patrons of the soup kitchen. Laurie Matties, MMI’s Community Connections Supervisor knew this was a project that several volunteers at MMI would be passionate about. When the project was presented to the Mt Pleasant Jaycees they generously provided the funds needed to get started. The community garden and the produce grown during this past summer is a testimony to what can be achieved when individual’s passions are matched with community need. A huge thank you to all those in the community who helped develop fund, plant, weed, and water the garden. MMI has been a proud member of the Mt Pleasant community for over 40 years with the mission to Enrich Lives Through Employment, Training and Community Access. For more information on how you can get involved in the community garden or other community volunteer projects contact MMI at 989-773-6918.